Don’t let your investment property aspirations stand in the way of a well-deserved holiday; there are ways to get away without breaking the bank. 1. Stay close to home – Usually the further from home you travel, the more expensive the trip. Scope out some locations nearby that you can enjoy without having to spend money on excess travel – and get to know your own backyard in the process! 2. Choose your location carefully – Some holiday destinations are more expensive than others. 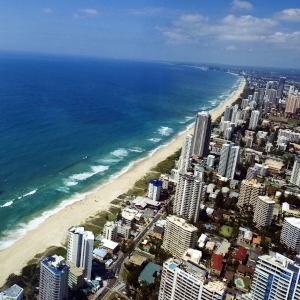 Instead of going to the more pricey and crowded beaches of the Gold Coast, why not pick a beachside holiday without the price tag? 3. Avoid peak seasons – Holiday destinations are always more expensive during peak season. If possible, avoid travelling during the middle of the school holidays, with most places cheaper at the beginning or end of the season. 4. Book online, book early – The earlier you book accommodation or flights, the cheaper they are. You can get some good deals with last minute bookings but availability is usually limited and you may be restricted to certain dates. Also, book online and save money you’d otherwise spend on a travel agent. 5. Cook yourself – Look for accommodation with a kitchen and you will save large amounts on food. Try and do your grocery shopping in bulk before you leave or from a supermarket when you get there. Forget room service unless you have squillions to burn! 6. Package deals – Look for package deals that include flights, accommodation, transfers and food. It may seem like a lot upfront, but when you add up holiday expenses you will see the savings. 7. Eliminate excessive baggage – If you are flying, travel light since excessive baggage often comes with a hefty fee (especially with some of the budget carriers that you might also be using to save money). 8. Finally, beware the credit card! – It’s all too easy to simply swipe your card and forget about it when on holiday. Set a daily budget and use cash so you can keep track of how much you’re spending, otherwise you may get home to a bill that wipes out all your savings efforts elsewhere. 9. Property investors nearly always need to set themselves a budget and monitor their monthly spending, so a well-earned holiday can be a good way to reward your diligence. Just keep track of how much you’re spending on your break.